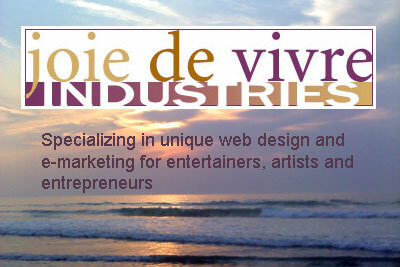 Joie de Vivre Industries is a web design and e-marketing firm specializing in unique web development for artists, entertainers and entrepreneurs. Call 603-997-6963 or email us. We will work with you to design a completely customized, original, professional, one-of-a-kind, search engine-friendly Website, Blog and/or Facebook Landing Page to fit your business needs and attract people to your products or services. We can also maintain your existing website economically. Visit our graphics page for a sampling of logos and marketing materials.